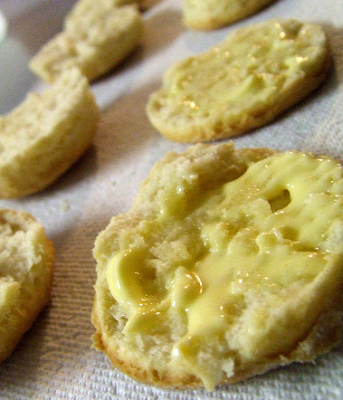 One of my downfalls when the holiday season rolls around, is a hot buttered biscuit. Who doesn't love a warm biscuit out of the oven to go along with their Thanksgiving meal?? Or on Christmas morning with some raspberry jam... MMM! Preheat oven to 400 degrees. Line a baking sheet with parchment paper. Mix almond flour, baking powder and salt together in a large mixing bowl. Cut in cold butter with a fork until the mixture is crumbly. Place the bowl in the refrigerator for 10 minutes. In a medium bowl whisk egg whites until they are very frothy. Fold the egg whites into the chilled flour mixture until well combined. Scoop about 1/4 cup of dough onto the baking sheet and smooth the top to form each biscuits, an ice cream scoop works well in this step. Bake for 15-18 minutes, or until the tops are golden brown! Cant wait to try these! Thanks! For these being my first almond flour biscuits, they turned out quite nice. I had to double the dry ingredients because the six egg whites made for a very watery mix.